Hilariously obnoxious postcards, perfect for friends and frenemies alike! 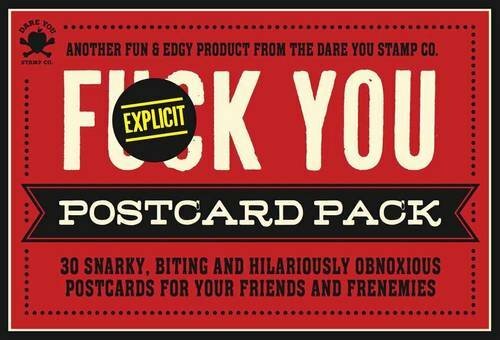 From the Dare You Stamp Company, the bold and brash team that brought you the F*** You Stamp Kit, comes a new way to tell your friends and frenemies alike to F*** Off: The F*** You Postcard Pack! With 30 postcards printed with sentiments like Wish You Were Beer... and Flip Yourself Off, I m Busy, now you always have the perfect insult right at your fingertips. Just tear it out, slap on a stamp, and let the good feelings fly going over the edge has never been so much fun!